View balances of checking, savings, investment, and loan accounts. Deposit your checks without even stepping foot inside the bank! 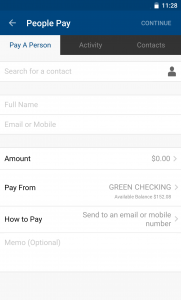 With our mobile app, you can take a picture of your check, and funds will typically be available the next day. How do I deposit a check? Deposit up 10 checks or $2,500 per day AND up to 20 checks or $5,000 within a 25 business day period. See disclosures and details. Third-party carrier message and data rates may apply while using Mobile Deposit on Standard Bank’s mobile app. Pay nearly anyone with just a mobile phone number or e-mail! People Pay (P2P) allows you to pay nearly anyone via an e-mail or mobile phone number (up to $500 per day, per transaction. See details). Supported by top-level security, People Pay saves you the hassles, expense, and time spent with paper checks. 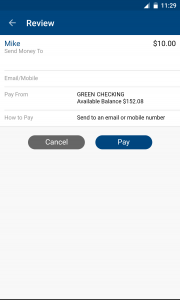 You can use People Pay in online banking or through our mobile app. Payees will be sent a link to our secure online banking site to claim their money and put it into the bank or PayPal® account of their choice (within the U.S). How do I enroll in People Pay? Before you use People Pay online or through our app, you need to first enroll and be approved to use People pay. How do I use People Pay on my computer? How do I use People Pay in the mobile app? People Pay transactions are limited to $500 per transaction, $500 per day, per delivery channel (Account to Account; E-mail or mobile phone number; PayPal®). Transactions are limited to deposit to U.S. accounts only. Transactions may be immediate or have a slight delay from time of acceptance. Payments sent to a mobile phone or e-mail will expire after 30 days. Payments conducted through PayPal® will not expire, as they happen in real time and will either succeed or fail immediately. If the recipient does not wish to open a PayPal® account, you will have to allow the PayPal® payment to expire (after 30 days) before the debited amount is returned to your account. Standard Bank puts the control in your hands with customized debit card preferences, settings, and alerts. Available only in the Standard Bank app, increase your debit card security with just a few taps. In addition, you have the convenience to enable/disable your debit card instantly! Maybe your card was lost or stolen. Maybe you want to add an extra level of security. With card controls, instantly turn your debit card on/off with one quick tap. This feature offers peace of mind and instant security. Do you only use your debit card for certain types of transactions? Customize which types of payments are permitted based on the transaction types you choose. Match your controls to your debit card spending habits. Limit what types of stores and services have access to processing payments with your debit card. Simply tap the slider to enable or disable certain categories of merchants or stores. When you enroll in card controls, you will automatically receive push notification alerts for every transaction made with your card. Further customize or disable these notifications in the “Alert” section of mobile banking. What is text banking? Text banking gives you access to your accounts via text (SMS) messages on your mobile phone. If you don’t have a smart phone (but want quick account information) this is a fast, easy way to get information quickly. After you enroll your phone, all you do is text command (see below) to Standard Bank’s shortcode: 49794. The wireless carriers are not liable for delayed or undelivered messages. One text message per query. Message and data rates may apply. Learn more at Standard Bank’s Terms and Conditions. For more help, call our local Customer Care Center during local business hours: 1-866-856-2265 . Supported carriers for text banking include AT&T, T-Mobile, U.S. Cellular, Sprint, Verizon Wireless, MetroPCS, Cricket (see more here). What is STATLine? STATLine is Standard Bank’s toll-free, automated telephone banking system. With 24/7 access to your deposit and loan accounts, you will have important account information at your fingertips in minutes! Simply call 1-877-856-BANK (2265) from any touch-tone phone and follow the voice instructions. Need help with telephone banking? Please call (724) 547-7515. PRESS 1 if you are calling from a touch-tone phone. These phrases are played at the end of the main menu. These phrases are played at the end of each menu (with the exception of the main menu). * Surcharge-free access to all Standard Bank and PNC Bank ATMS. PNC Bank is a registered trademark of The PNC Financial Services Group, Inc. PNC Bank, National Association. Member FDIC. Apple, iPod, and iPad are trademarks of Apple Inc., registered in the U.S. and other countries. iPhone and Apple Pay are trademarks of Apple Inc. App Store is a service mark of Apple Inc. Third-party carrier message and data rates may apply.